FootGolf combines the best of football and golf, two of the most popular sports in the world and is now open at Belhus Park Golf Club. The beauty of the game lies in you being able to strategically combine power and precision every time you play FootGolf. And, of course, it is open to everyone. Call the Golf Shop on 01708 854260 for further details. Book your tee off time! Children under 12 years must be supervised at all times by an adult. Do I have to book and how do I book to play? We always recommend booking in advance, as our course may be busy or may be booked out for a group or competition. You can bring your own football to play as long as it is a standard size 5 ball. Footballs are available to use for free from Belhus Park Golf Shop, for players who don't have their own or who wish to use the course balls. Football boots and blades aren't permitted on our course - FootGolfers are encouraged to wear trainers or astroturfs. 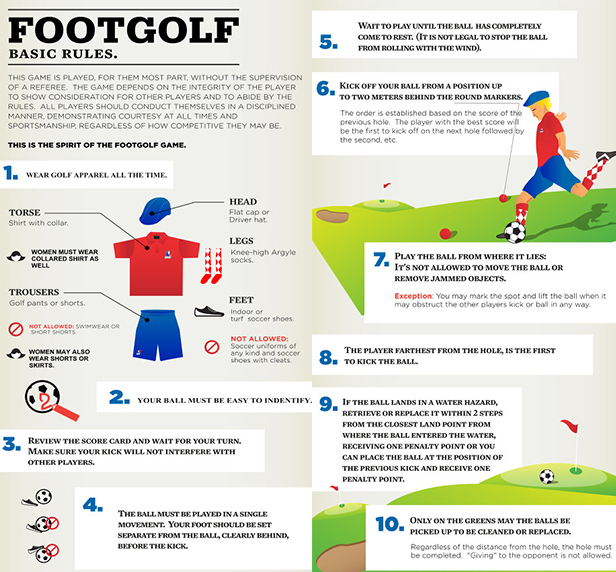 It is recommended that FootGolfers wear a collared shirt and either plain shorts or trousers at all courses. As a sport, we promote the traditional golfing attire – long socks, long shorts, collared shirts, and a traditional golf hat. This type of garb is proving very popular among players, but we don't enforce this for regular play. FootGolf will be available on Tuesdays, Thursdays and Saturdays from 2.00pm. During this time, the first 9 holes of the golf course will be closed with the second 9 holes remaining open for play. The Golf Shop is located next to the Tee Room Café in front of the 1st tee of the golf course and is managed by our resident PGA Golf Professional who is on hand to give expert advice and guidance. Open seven days a week for all your golfing needs. We offer a wide range of golfing equipment, fully stocked with major golfing brands. The Golf Shop is an official stockist of Callaway, PING, Odyssey and many more. We also offer custom fit options on all new clubs and can even order stock in if by any chance we don’t have what you require. The Golf Shop is a registered retailer for Adidas, Nike, Proquip, Stromberg and Cypress Point clothing, as well as the latest fashions in golf footwear. We stock miscellaneous sundries required for play such as golf balls, tees, gloves, trolleys, golf bags, general accessories and refreshments that you can take to the golf course. The Golf Professional Shop is managed by our PGA Professionals who are on hand to give expert advice and guidance. This really is a one stop shop where you can pay your golf green fees, book your round of golf and enquire about golf tuition. Gift Vouchers are available to purchase. Make your round easier and hire one of our trolleys or buggies. The Golf Shop offers trolley hire for £3.00 per round and golf buggies are available to hire at £16.50 per round. To reserve a buggy, please contact the Golf Shop on (01708) 854260. There is an on-site workshop to carry out all club repairs from re-gripping, re-shafting, extensions and a loft and lie service is also available. For more information and prices, please contact the Golf Shop on (01708) 854260. Half sets of golf clubs, shoes and trolleys are available for hire from the golf shop. Single clubs are available to hire for use at the Driving Range and are available from the Impulse Leisure - Belhus Park Reception. For more information, please contact the Golf Shop on (01708) 854260. We know every society or company has its own idea of what makes a great golf day we provide a wide choice of all – inclusive weekday packages that can be tailored to your enjoyment and budget. Our society days and group booking packages are ideal for team building events, birthdays, Christmas parties and much more. Further details of our corporate and society days, call The Golf Shop to discuss your bespoke day on (01708) 854260. Coffee and a bacon roll, followed by 18 holes. Coffee and a bacon roll, 18 holes followed by a hot lunch. Full English breakfast, 18 holes followed by a hot lunch. Full English breakfast, 50 warm up balls in the Driving Range, 18 holes followed by a hot lunch and more holes optional. "A day at Belhus is a great delight to me. Belhus is a beautiful course, which has greatly matured since my first game over twenty, and all the green staff do a great job of maintaining and improving it. The course is short but very challenging, offering fun at all levels. My friends from abroad love it when they come to play it. Whenever it’s on the course itself, the driving range, the cafeteria or the bar, all of the staff are helpful and friendly. The Pro Golf Shop is also well stocked and always tidy. The staff are well trained and always ready to help you to find equipment that is suited to you. I also find the fees very reasonable and feel you are getting a lot for the money. Why not take my advice and give Belhus Park a try, you won’t be disappointed." "Belhus Park is a tree lined parkland course that is a good test of golf for the low handicap golfer but also allows the average player to enjoy their round without being too difficult. Anybody wishing to get a handicap only has to play in three competitions to attain one and the club holds many tournaments all year round with the seniors enjoying midweek games as well, so getting your handicap is very quick and easy. The beauty of Belhus Park is the great drainage so that even after a long downpour the greens will be playable within the hour and the fairways dry very quickly too. Only snow will close the course. We play the grass tees all year round and the fairways are kept well maintained. So if you are looking to play competitive golf come over and join the club. Even if you only want to play for fun you can still come and play a very cheap green fee. You will not be disappointed." Our resident PGA Professional provides a wide range of lessons to suit all abilities, from beginners to the more accomplished and expert golfers. Tailored to your individual needs in all aspects of the game – including Long game, Short game and Course management, lessons are taken on the driving range or as play and learn sessions on the course. So whether they’re the next Justin Rose, or just looking to practice their putting, our coaches are on hand to help at every stroke. Gift vouchers for lessons are now available from the Belhus Park Golf Shop! For more infomration or to book your lessons, please call the Golf Shop on (01708) 854260.